We are KBK a leading Jute, Cotton, Canvas and Juco bags manufacturer based in Kolkata, India.We manufacture all type of shopping bags, promotional bags, carry bags. Now-a-days canvas partition bags are in great demand for their unique design and reusability. 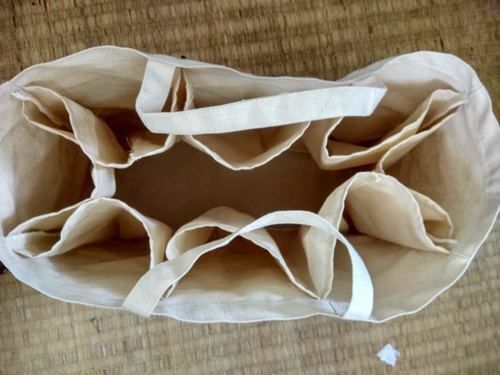 These bags are 100% reusable, eco-friendly, durable in nature can carry 5 to 10 Kgs easily. As a quality conscious organization, we lay emphasis on offering our esteemed clients quality proven range of products. We don't believe in compromising on quality over pricing as in the long run it’s the quality of the products which speaks for itself. With our in-house quality section, we test this procured raw material for its finish, glossy look and durability. Our quality controllers strictly monitor the entire production process, right from the time of procuring of raw material till the final delivery of the consignments at the clients’ end. In addition to this, all the finished products are tested on various quality parameters to ensure to ensure flawlessness in the entire range. Being a client centric organization, our clients are the most vital causes behind the growth and success of our company. Our main concern is to keep long-term and healthy relationship with the clients by providing them flawless assortment of Gemstone products. Owing to our ethical business policies, client centric approach, transparent dealings and easy payment modes, we have garnered vast client base all across the globe. 1. Payment Method: T/T (Wire Transfer), Western Union, Money Gram or any other payment method according to the convenience of the buyer. 2. Goods will be sent through Air freight (FedEx, DHL, and UPS) or any other freight service as per buyer's requirement. 3. Delivery time will be 15 to 20 Working Days in India & 30 to 45 Working days in Abroad from the day the payment is received. 4. Shipping fees will be paid by the buyer. Depending on quantity it’s very nominal. 5. For sample, Worldwide Delivery with in 5 TO 7 Working Days. 1. To receive samples please contact us through email, skype or call us. 2. Minimum order is of 500 pieces . 3. Payment - We accept payments through Wire Transfer (T.T. ), Irrevocable L.C. (Letter of Credit), PayPal and RTGS. 4. We customized products in terms of material, shape, size, design, color and packaging as per clients specifications. 5. We believe in quality of our products and the customers comfort before anything else. We are a member of FIEO and a trusted supplier in indiamart portal.